Hundreds of Iowa high school students may lose access to required foreign language classes if lawmakers don’t provide a cash infusion to a state-run initiative. 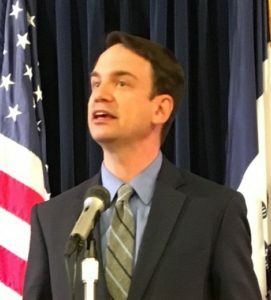 The program is called “Iowa Learning Online” and Iowa Department of Education director Ryan Wise uses the shorthand “I-LO” when discussing it. “It is virtually impossible to get the fees and the demand at a point where ILO pays for itself,” Wise said during a recent budget presentation in the governor’s office. The program was launched six years ago with an annual budget of $1.5 million in state tax money. That funding ended three years ago and schools are now charged $260 for each online course offered to each student. Once the fees went into effect, enrollment dropped by 40 percent and Wise said federal funding to supplement those fees is no longer available. “Really, without a state appropriation at this point, there’s not a sustainable path forward,” Wise said. That’s especially critical for students in rural Iowa, according to Wise. Nearly 75 percent of the Iowa Learning Online courses being taken now are foreign languages. About 1,700 Iowa high school students are enrolled in the program’s online courses for this school year. Wise is asking the legislature and governor to provide half a million dollars in state tax dollars so the program can continue in the next school year.